Johnny Maddox at the piano with his recent protege Adam Swanson. Johnny Maddox, one of the most recognizable personalities in ragtime history died Tuesday, November 27th, he was 91. He planted the seeds of a ragtime revival that would bloom with the classical revival of ragtime music in the late 60s. Johnny Maddox was born on August 4, 1927 in Gallatin, Tennessee. He learned piano as a toddler from his Aunt Zula Cothron who had played ragtime at the 1904 Louisiana Purchase Exposition in St. Louis. Maddox began performing publically at age 5 and had a professional career by the time he was 12 years old. He became a nationally recognized star after the release of “St. Louis Tickle” backed with “Crazy Bone Rag” on Dot Records in 1950. It sold 22 thousand copies in just a few weeks. Maddox carried Dot Records, which was owned by his friend Randy Wood, to national prominence, recording a series of hits for them until 1967. His discography runs to over 50 albums and 90 additional singles. In the early 50s, he appeared with major stars from Sophie Tucker to Elvis Presley. He had a hit playing Bob Wills’ “San Antonio Rose”, bringing the sounds of his piano to millions of ears. He had another major hit with “In The Mood”. His sound caught on with the public and by 1954 he had been declared the “Number One Jukebox Artist in America” by the MOA (Music Operators of America). The next year he recorded his biggest hit, a version of “Crazy Otto Medley” that spent 14 weeks near the top of the Billboard Chart and became the first all-piano record to sell more than a million copies. He went on to have nine gold singles. During his broadest fame in the 50s and 60s he appeared on all the major television variety shows, and in major city venues nationwide, but he also toured state fairs, playing a piano mounted on the back of a pickup truck. He befriended many of the surviving stars of the original ragtime and early jazz era, including W.C. Handy, and appeared with rising country musicians like Patsy Cline. Always one to have a home base, he maintained a 17 year engagement at the Red Slipper Room in Denver, Colorado’s Cherry Creek Inn through the 50s and 60s. He attempted to retire several times but continued to perform regularly until 2012. He played at Il Porto Ristorante in Old Town Alexandria, Virginia for many years and then from 1996-2012 at the Strater Hotel’s Diamond Belle Saloon in Durango, Colorado. He amassed one of the largest collections of original ragtime sheet music in private hands, totaling more than 200,000 pieces. 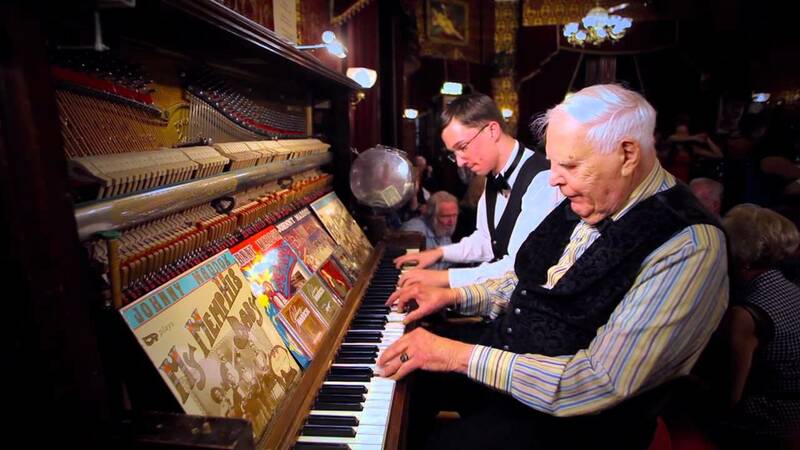 In recent years he has befriended and performed with young ragtime pianist Adam Swanson.